Turn your smartphone or tablet into a personal trainer: ELITE's myETraining App is a new and exciting way to manage ELITE hometrainers and structure training sessions. Free Level Training Option. A 1 year subscription for € 19.99 (prices may vary by country) activates all myETraining options. - RealVideo and myRealVideo training: Chose from among the many RealVideo available for purchase or download some of the many user-created myRealVideos. The video of the course adjusts to match your speed* to create an immersive cycling experience. Use with Interactive Hometrainers: myETraining automatically adjusts the resistance for an even more realistic cycling simulation. You're free to choose how and where to start on-video training; pick any location on the map to begin. - ANT FE-C and Bluetooth Support for ELITE Hometrainers. - Compatible with ANT+ or Bluetooth Smart power measuring sensors (ergometers) (compatibility may depend on the device used). - Cloud-based Data: Your training data can be directly stored by your cloud account and shared between your personal devices. - New, simple procedure to create training programs. - Video or audio playlist creation. - Road race GPS course recording to later relive your training sessions with myETraining maps. - Data export to Strava and MapMyRide. You'll be able to display power, cadence, heart rate, speed, time and distance data directly on your smartphone or tablet iOS. 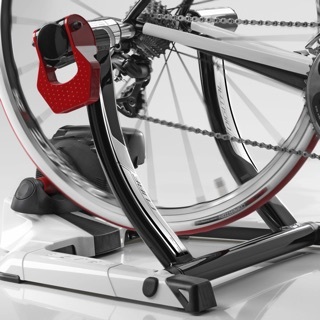 myETraining is compatible with the following ELITE hometrainers and rollers: Real Turbo Muin, Turbo Muin, Digital, Hydromag, Fluid and Magnetic technology-compatible hometrainers and many more. Please check the configuro.elite-it.com site to verify compatibility. Basic Training: choose from constant power, levels or preset programs as your training mode. Training Test: create a monthly program based on your previous test results. Map races: create tracks anywhere in the world on Maps and simulate them with your hometrainer. History: save your training data to analyse your progress later on. Save, share and export all your training data to evaluate your performance and improvements. Export your data directly to Strava and MapMyRide with just one click. Check configuro.elite-it.com to see if you need additional hardware to use myETraining. 1) Doesn’t work when phone is locked. 2) To get avg 14mph on tri bike have to basically push like outside doing 19+ so it’s way off so the miles are not accurate. It should be one star but let’s just keep going, I hope it can be great app in near future!!! Bluetooth connection is not that great. I just purchased a trainer that works with this app. I was really excited about the training data that it shows with the built in workouts, but have a been a little disappointed in the app so far. The training program works great for a little while; then 10-20 minutes into the workout, it disconnects from Bluetooth and just stops. Also, the site claims that any heart rate monitor that works with my phone will work with the app. However, my heart rate monitor works great with my phone, but the app will not recognize it.